If you have a propane furnace in your home, your tank needs to be refilled from time to time. 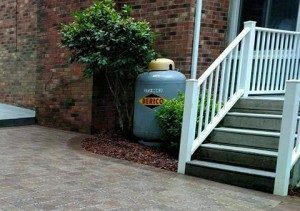 You probably have a supplier who delivers propane to your home. What if that same propane supplier could also repair your furnace if the need arises? If your current propane supplier is not also an experienced HVAC company, consider switching to an all-in-one service. Burlington furnace repair and propane delivery can all be done by Alamance Oil. Alamance Oil provides reliable furnace repair and propane delivery service for Burlington and surrounding areas. If you are in need of a propane tank refill, fall is a good time to schedule delivery. Don’t wait until the weather is already cold, because that’s when everyone else will be in need of propane and you have may have to wait longer for a delivery. Propane suppliers offer service plans that include regular delivery to ensure you never run out. When you are a long-time customer of an experienced supplier, your usage is tracked and calculated so that deliveries are timed accurately. As with any machine, your furnace may need repairs occasionally. If your propane supplier is also an HVAC repair service, you know exactly who to call. A propane supplier that also does repairs is even more knowledgeable about your propane furnace than your average HVAC company. Every part of your heating system from the furnace to the propane tank can be taken care of by one experienced company. The importance of maintenance for your HVAC system is something that is becoming common knowledge. Regular maintenance is necessary to keep your HVAC system running at its best. An all-inclusive gas and HVAC company like Alamance Oil offers a package deal that includes biannual maintenance for your HVAC system and propane delivery. Alamance Oil’s Comfort and Protection Service Agreements offer regular tune-ups, discounts on repairs, priority service, and bonus bucks. Different plans vary, but all have definite advantages. An all-in-one HVAC company can not only deliver your propane and repair your furnace, but repair and maintain your air conditioning as well. Alamance Oil is also qualified to service your central air conditioning as part of your HVAC system. Just as your heating system needs a tune-up in the fall, your air conditioning system should have a tune-up in the spring. When you sign up for a Comfort and Protection Service Agreement with Alamance Oil, you are getting three services in one. Alamance Oil has been providing Burlington furnace repair and maintenance, propane delivery, and air conditioning repair and maintenance since 1924. New customers receive free propane tank swap outs and long term savings when switching to Alamance Oil. Sign up for a maintenance and propane delivery plan and start saving.